In addition to his role as Chairman of the Board overseeing the management of the firm, Bob Klein has been responsible for the technical and marketing development of Applied Marketing Science’s products and services, including VOCALYST®. He has led major client engagements in the various practice areas of Applied Marketing Science (AMS), with particular focus on the litigation support practice area and the energy industry. He has served as an expert witness in over 100 cases involving marketing science and consumer behavior in cases related to trademark infringement, confusion, patent damages, class certification, trade secrets, sales forecasting and others. He has testified over a dozen times in Federal Court in the U.S. and Canada. 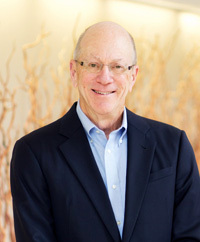 Prior to his founding of AMS in 1989, Bob was executive vice president of Information Resources, Inc. (IRI), the fourth largest market research company in the world. Bob joined IRI in 1985 as part of the acquisition of Management Decision Systems, Inc. (MDS), the marketing consulting and computer software firm he had co-founded in 1970 with various MIT professors and students. Over MDS’ fifteen year history, he played a variety of roles, including head of new service development, lead consultant, chief financial officer, and profit center manager. He was responsible for the development and marketing of a number of MDS’ most successful products and services including the ASSESSOR model for the prediction of new product success. Bob has been a frequent speaker to business and professional groups. His articles and commentaries on a wide range of marketing science topics have appeared in the Harvard Business Review, Advertising Age, Marketing News, The Handbook of Sales Promotion, and the published proceedings of many academic and professional conferences. He is a member of the Institute for Operations Research and the Management Sciences, The American Society for Quality, and The Product Development and Management Association, and he is a Certified New Product Development Professional (NPDP). He is AMS’ representative to the Council of American Survey Research Organizations and to the International Trademark Associations. He is also a past member of the Proof of Confusion Subcommittee of the International Trademark Association’s (INTA) Enforcement Committee and INTA’s Oppositions and Cancelations Committee. Bob grew up in Atlanta, but he has lived most of his adult life in the Boston area. He is a Life Master in bridge and an avid (some say fanatic) golfer with two holes-in-ones to his credit (but he often struggles to hit two good shots in a row). He gave up windsurfing for hiking and has trekked to Machu Picchu in Peru, Torres del Paine in Patagonia, the High Atlas Mountains in Morocco, the Eastern Himalayas in Bhutan and the Grand Canyon. Ask him about his grandchildren. Bob received a S.B. in mechanical engineering in 1966 from MIT and an S.M. in management in 1968 from the MIT Sloan School of Management.